RussJones.Us: The Key To Life Is . . . The Key To Life Is . . .
Each morning I listen to motivational guru and business leader Darren Hardy give me a 5(ish) minute motivational talk about life, vision, leadership, business and other stuff. Now I don't know if Darren practices any kind of faith in Christ. I have been able to ascertain that he is familiar with the Bible and other forms of religion. But something he said this morning really got my attention. "Be of values to others first, giving first . 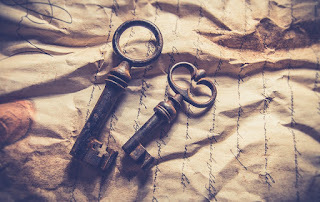 . . "
The key to life is - give it all away. When you give value - you will receive it. When you give hope - you will get more. When you give joy - it will come back to you. It isn't karma. It's called the law of sowing and reaping. Karma says that you will reap in the next life what you sow in this one. The Bible is clear, you only get one life. So are you going to horde everything that you have and keep it for yourself? Or are you going to share it all and allow God to provide you with even more?